A C-style piercing valve (also called a “saddle valve”) is included with your cooler. This is used to “tie in” to the water source to get water to your new bottleless water cooler. However, this only works on rigid pipes. If you are going to “tie in” to a flexible pipe under your sink, you probably want to use a Max Adapter. 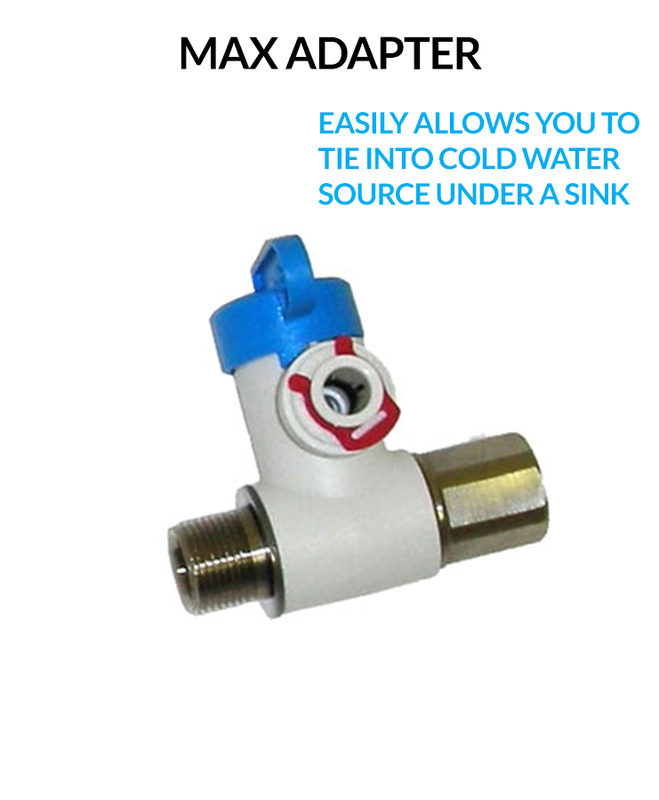 A C-style piercing valve is included with your cooler. This is used to “tie in” to the water source to get the water to your cooler. However, this only works on rigid pipes. If you are going to “tie in” to a flexible pipe under your sink, you probably want to use a Max Adapter. Here is what a Max Adapter looks like when it’s attached to the cold water supply under a sink. Copyright 2018 © XO Environmental, LLC. All rights reserved.